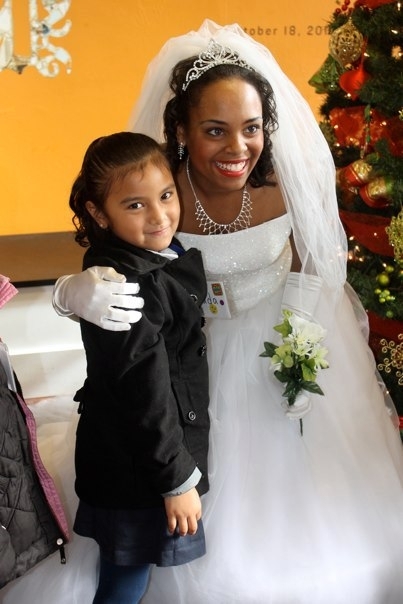 Lexi Hart, as Cinderella, poses with a student from Malcom X Elementary. How many theatre companies give you the opportunity to meet CINDERELLA? All right then. The Bay Area’s awesome African-American Shakespeare Company is facing a 400% rent increase. This is MADE OF NONSENSE. What’s nonsense is that they pay any rent AT ALL, considering how much the building gets in subsidies from the San Francisco Arts Commission. They should be given a 50 year lease at $1 a year, as so often happens when a theatre is in a city-run building and vital to the surrounding community. Af-Am Shakes keep ticket prices accessible and they do classic plays, so, basically, they’re not going to be able to suddenly start turning some monster profit, and anyone who’s had 15.3 seconds of experience in the nonprofit world knows that. A 400% rent increase looks like an assassination attempt to me. We all know what happens when a company is forced out of their long-term space and into a volatile rental market. So please join me in writing or calling the San Francisco Arts Commission TODAY in support of this fantastic theatre. The letter I wrote is below. You are more than welcome to copy and paste whatever you like from it to use for your own letters. 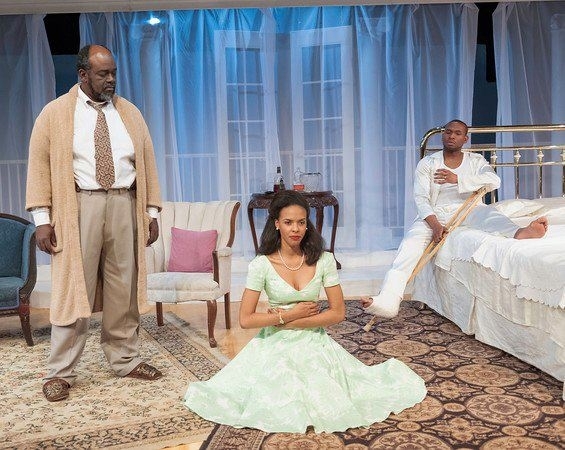 Peter Temple, ZZ Moor, and Tyrone Davis in Cat on a Hot Tin Roof. Photo by Lance Huntley. Maggie’s about to make her big announcement. I urge you to protect the vital theatre institution that is the African American Shakespeare Company. This company is one of the most valuable theatres in the Bay Area. Theatres are constantly being told that we need to have more diversity on our stages and in our staffs. African American Shakespeare Company provides more opportunities than any other organization in the Bay Area for Black theatremakers to hone and showcase their skills. Theatres are constantly being told that our industry will soon die if we can’t attract more diverse audiences. African American Shakespeare is creating those diverse audiences. Their annual holiday production of Cinderella has, over the years, turned thousands of children of color into theatre lovers who will grow up to be our audience members, subscribers, and donors. Their lively, high-quality, impressive productions of classic plays attract the most diverse audiences in the entire Bay Area. The importance of this company to the health of our local theatre community, both theatremakers and audiences, cannot be overstated. A 400% rent increase is unsustainable for ANYONE, let alone an arts organization. Like all small theatre companies, African American Shakespeare is struggling to make ends meet. This is not a situation where they have more but are just unwilling to part with it. Artistic Director Peter Callender is doing an exceptional job navigating his company through a difficult economic time. African American Shakespeare is a very successful small company, but it’s unrealistic to expect them to turn the kind of profit that can sustain such an outrageous rent increase. It’s unrealistic to expect them to turn a profit AT ALL, since almost all nonprofit theatre companies cover their expenses largely through grants and donations. If you want to keep ticket prices accessible, you simply cannot make enough earned income to cover your expenses. In this economy, where grants have become tougher to land, and donations have fallen off, a rent increase of any type can spell the end of a company. It’s a shocking move. Such an enormous rent increase looks, to those of us in the theatre community, like an assassination attempt. Everyone knows what it means to be forced out of your space. Most companies never recover. It’s actually shocking that African American Shakespeare Company pays rent at all. Many resident theatres do not pay rent, and with the gigantic subsidy the space receives, one wonders why such a valuable asset to the space is being asked to pay rent at all. I know, as the SF Arts Commission, you are already aware that theatre is a destination business. It draws people into the neighborhood who would not otherwise be there, ready to pay for dinner, after-show drinks, and otherwise patronize neighborhood businesses. In addition to its value to the neighborhood, African American Shakespeare Company is creating the diverse theatremakers and audience members our industry will wither and die without. Considering their exceptional value to the building, the neighborhood, and the theatre community both locally and nationally, they should be given a 50 year lease at $1 a year. Let the subsidy pay their rent. The annual $500,000 from the city is more than enough to underwrite this crucially vital company, and much, much more. If Ms. Hayes is having trouble sorting out how to handle the finances of a nonprofit organization, and cannot generate a budget and development plan that incorporates this proposed $1 a year rent, there are literally hundreds of people in the Bay Area theatre community who are more than qualified to take the reins. Again: Save this vital company and ensure their continued, invaluable contributions to the theatre community. Step in and stop this nonsense. Their rent should be subsidized. Negotiate a contract—like so many resident companies have—of $1 a year. It’s an investment in the health of the future of the theatre community, both locally and nationally. BECAUSE I BRING THE TITLE OUT WHEN IT’S IMPORTANT, OK? Don’t give me that look. just sent my letter – thanks Melissa for the heads up.